Where is the motor cortex? The motor cortex is found in the frontal lobe, spreading across an area of cortex situated just anterior to a large sulcus known as the central sulcus, which runs down the side of the cerebral hemispheres. 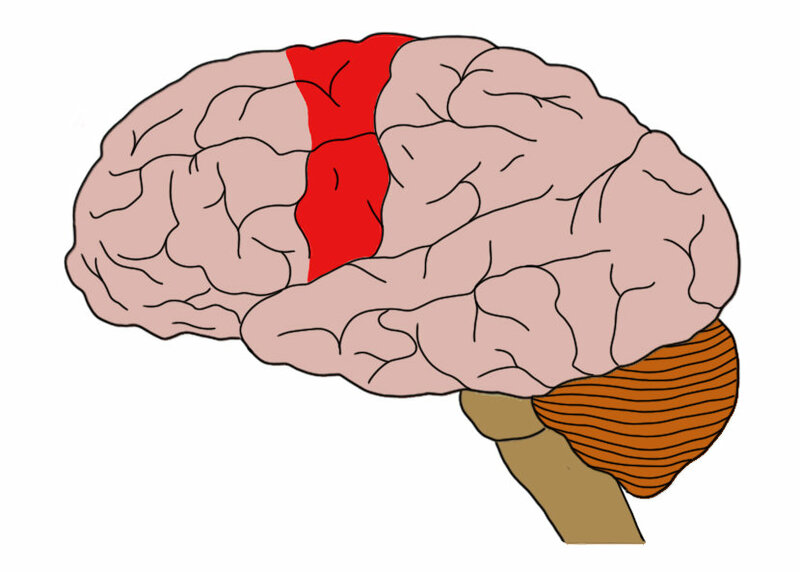 The motor cortex is often divided into two major regions: the primary motor cortex, which is found in a gyrus known as the precentral gyrus that is positioned just in front of the central sulcus, and the nonprimary motor cortex, which is anterior to the primary motor cortex and contains two prominent regions known as the premotor cortex and supplementary motor cortex. What is the motor cortex and what does it do? In 1870 physicians Gustav Theodor Fritsch and Eduard Hitzig, using awake dogs as their subjects, electrically stimulated the area of the brain we now know as the motor cortex and found that the stimulation caused the dogs to move involuntarily. Additionally, they found that stimulating the motor cortex in different locations caused different muscles to move. This experiment led to the identification of the motor cortex as the primary area of our brain involved with planning and executing voluntary movements. There are several distinct regions within the motor cortex. The area found to be the most sensitive to electrical stimulation--in that it requires the least amount of stimulation to produce a corresponding muscle movement--is the primary motor cortex. The primary motor cortex is arranged such that different parts of the region are associated with motor control of different parts of the body, a topographic organization that is similar--although less precise--than that seen in the somatosensory cortex. Watch this 2-Minute Neuroscience video to learn more about the motor cortex. The primary motor cortex contains large neurons with triangular-shaped cell bodies that are called pyramidal neurons; these are the primary output cells of the motor cortex. The axons of pyramidal cells leave the motor cortex carrying information about a desired movement and enter one of the tracts of the pyramidal system, which includes the corticospinal and corticobulbar tracts. Both tracts carry information about voluntary movement down from the cortex; the corticospinal tract carries such information to the spinal cord to initiate movements of the body, while the corticobulbar tract carries motor information to the brainstem to stimulate cranial nerve nuclei and cause movements of the head, neck, and face. Pyramidal neurons of the motor cortex are also known as upper motor neurons. They form connections with neurons called lower motor neurons, which directly innervate skeletal muscle to cause movement. Other areas of the motor cortex, known collectively as the nonprimary motor cortex, are found anterior to the primary motor cortex and also appear to play important roles in movement. Despite their name, the nonprimary motor areas shouldn't be viewed as taking a secondary role to the primary motor cortex. Instead, the nonprimary motor areas are just involved in different aspects of movement, such as the planning of movements and the selection of actions based on environmental context. The nonprimary motor cortex is often divided into two main regions: the supplementary motor cortex and the premotor cortex. The exact functions of these areas are not very well understood. It is thought that the supplementary motor cortex may be important to the execution of sequences of movement, the attainment of motor skills, and the executive control of movement, which can involve things like making decisions to switch to different movements based on incoming sensory information. The premotor cortex makes a large contribution (~30%) to the neurons that will enter the corticospinal tract, but it seems to be more active than the primary motor cortex during the planning of--rather than the execution of--movements. Neurons in the premotor cortex also appear to be involved with incorporating sensory cues (e.g. the location of an object to be grasped) into a movement to ensure it is executed properly, as well as with the selection of actions based on behavioral context (e.g. picking up a cup to move it from the table vs. picking up a cup to take a drink from it). There are also populations of neurons, sometimes called mirror neurons, in the premotor cortex that are activated when observing someone else carry out a movement; these cells may be involved in helping us to understand and/or imitate the actions of others. Kandel ER, Schwartz JH, Jessell TM 2000. Principles of Neural Science. 5th ed. New York. McGraw-Hill; 2013. Purves D, Augustine GJ, Fitzpatrick D, Hall WC, Lamantia AS, McNamara JO, White LE. Neuroscience. 4th ed. Sunderland, MA. Sinauer Associates; 2008.